If you plan to get neutered, wait until spring. I almost got hypothermia at the animal shelter! Maybe it's the teacher in me or perhaps my nonconformist writer's attitude (well, except for grammar---I conform to grammar rules), but I seem to notice poor communication and bad business practices when people around me don't. Today, I came within minutes of getting hypothermia at a "shelter." Uh-huh. Read and learn. Go on, get mad, but you know you agree. Sometime in September, an unknown predator dropped a kitten in Delicious's backyard. I suspect a hawk or coyote, but I'm a writer, so let's go with American Bald Eagle. The kitten was malnourished and sported an open wound. Delicious, a suppressed veterinarian for many years, cleaned out the wound (gag), and "doctored up the kitten." Gnome was present during all this critter drama, and in his sugar-minded fashion, named the kitten Lollipop — Lolli for short. In October, Delicious went to Panama City Beach, and I babysat Lolli and mama's Yorkie, Gypsy. Tall Child fell in love with Lolli. I was shocked at his immediate liking to Lolli since he hated my deceased Yorkie, Buzz, and always said he, "Couldn't wait to dig that hole." Don't worry, readers. I held him to that. He dug the hole. Maybe Tall Child likes Lolli's self-cleaning cat habits, the ease of a litter box that he never touches, or prefers soft meows over obnoxious yaps. Who knows? 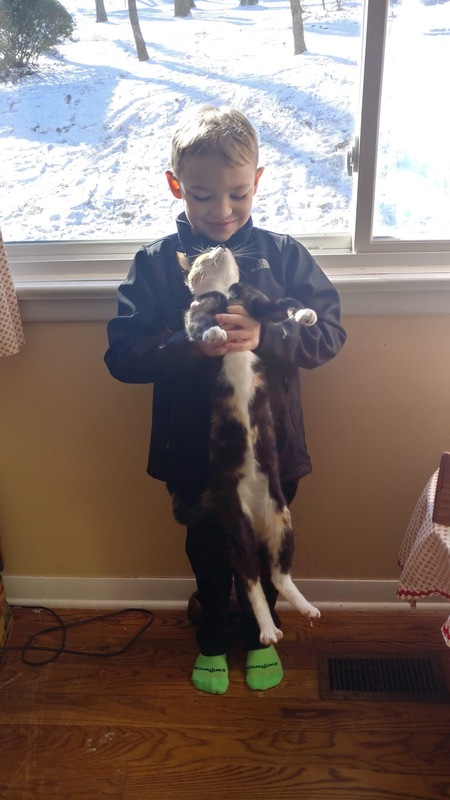 She probably likes Tall Child because he doesn't move around much and doesn't threaten her cat independence. She tolerates Gnome, and is even polite when he picks her up by the armpits, which causes her body give up and droop til her fuzzy toes drag the hardwood. Sharky and she were tight, until one night in November when she began to howl and fuss like a coyote. She filled our long hallway with distress, and I thought something terrible was wrong with her. Remember, she was a furry grab bag delivered by an unknown animal from an unknown location. For all we knew, she was RABID! I watched her closely the next day. She would whine, then move her tail to the side and back up. I called Delicious and told her the symptoms. "Bug, as many animals as you had growing up, you should know she's in heat." I explained it to Sharky. A month or so later, it happened again. He said, "Uh-oh, Mama. Lolli's heating again." Some events are too powerful; they must become verbs. Anyway, I Webbed up the humane society to find the cheapest route to having a nun-cat. Knoxville's Young-Williams Animal Shelter would do the trick. Drop off is at 8:00 AM and pick up is at 4:15 PM. Please come to the back of the building for drop off. Cat owners: Please bring your cat in a carrier, or pillowcase. FOR THEIR OWN SAFETY, CATS MUST BE CONTAINED AT ALL TIMES! Pillowcase? She's not a rattlesnake. So, I got up early and left my snowed-in-from-school boys asleep to take Lolli for her surgery. 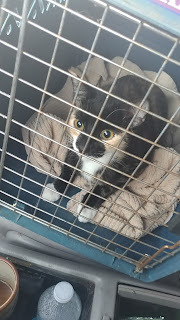 I warmed up the car, laid a soft towel in her carrier (NOT pillowcase), and consoled her as we rode to the clinic. There were two chain-link fenced cages. The left cage had an outdoor heater. I felt sorry for that overpromising, under-delivering heater. 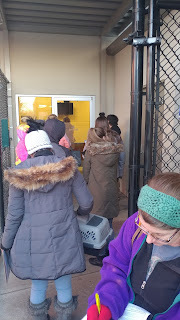 Naturally, we humans circled the heater, and waited for a shelter employee to open the door. A lady opened the door, and said, "Take a clipboard and fill out your form. Also, ALL the people who were scheduled for the Adair Clinic [closed because of snow and icy roads] need to stay on this side [heater side], and ALL the people scheduled to come here need to go to the other side [no heater side]. Well, two people stayed by the heater. We humans are such rule followers. The rest of us morons picked up our critter boxes and moved to the other cage. I wore leggings, an undershirt, a sweatshirt, and a fleece coat. Lolli had fur and a towel. I stood in line and watched the humans attempt to complete charts, but the pens wouldn't work. Why? The ink was frozen. I wanted to yell, "This treatment is inhumane, humane society!" Poor Lolli in the plastic box with way too many air holes cried out to me. "I'm sorry, Lolli. I know. Surely we won't wait long." I asked the crowd, "Why aren't we waiting inside? This is ridiculous." That chic in the colorful get-up said, "There probably isn't enough room." ...a campaign to build the new center as a partnership with the city and county along with private citizens who shared a passion for animal welfare. The city and county provided funds for the kennel holding areas while a newly organized Board of Directors raised funds for the adoption floor and upgraded amenities throughout the building. As a result of these efforts, Young-Williams Animal Center moved into a new $3.7M facility in May 2004. Hmmm, $3.7 million, and I'm in an outdoor cage? I have an idea for an amenity: a waiting room. I counted the people in line, and timed the first check-in. The first pet's process took five minutes. I multiplied 5 minutes by the 9 people in line ahead of me. Math doesn't lie. I would wait at least 45 minutes. ... a temperature of 0°F and a wind speed of 15 mph creates a wind chill temperature of -19°F. Under these conditions frost bite can occur in just 30 minutes. The temperature in that cage? At least it was sunny, not foggy, so I could easily see how stupid we all were. ...hypothermia still takes about 30 minutes to set in, and between an hour and two hours to kill you. Before this, if death does occur, it will probably result from complications due to something called cold shock. I was shocked all right...shocked at the stupid situation. I figured out that it would be hard to carry that cat box with frozen fingers, or at least hard to let it go. I looked down at Lolli. I picked up her box and walked into the shelter's front desk. I interrupted (YEP) the worker, and asked, "Is there any way we can wait inside?" He said, "No. We don't have room." I said, "Sure you do. Make an exception." Then he replied with a statement that, as a former manager and current business owner, I despise, "We can't do that." I said, "The temperature outside is ONE digit." I said, "It won't matter. We'll all still suffer. Five minutes of this is miserable." In businesses, we often hear, "I can't/We don't/That's not how we do it/It [the computer] won't let me/That's our policy." Translated into reality-speak, those phrases say, "I don't care/My boss is a control freak jerk/I have no imagination/I have no power/I have no initiative/I can't think." Well, Lolli and I CAN think. I gave him the form (which I had completed with my own, warm pen while the others in line struggled) and said, "Cancel this cat's spay appointment. She shouldn't suffer at an animal clinic. We'll be back in March." To the caged animals and people, I said, "I did the math. Good luck." I apologized to Lolli on the way home. Once inside our house, I let her out of the cage and heated some cat food for her. Sharky walked in and said, "That was a quick surgery." Well, Sharky, she'll be "heating again" soon, but at least she'll be warm. And so will her impatient human. Ahhh, much better now. Sort of.